Here are the last 8 I've done. I'm still trying to get my flash and lightbox setup dialed in. Sorry for the sawdust-y fingerprint on my fabric, didn't notice until everything was cleaned up and pictures loaded. Hybrid blank on a Shakespeare. I quite like this one, and it regularly finds its way into my pocket. Spalted maple with padauk, purpleheart, african blackwood and just a bit of zebrawood on a Mistral. A bit of a poor fit on the body, and I don't like the kit as much as I thought I would unfortunately. I think it would look better with a more simple blank. I've got another kit in the drawer to try again. Hard maple with african blackwood on a Poseidon. I really like this blank (hard to get a feel without being able to turn it in the hand) and think it fits the kit well. Had a small crack on assembly unfortunately. Classic kit with african blackwood and maple. I love these kits (one of my absolute favorites thanks to its size), but think I could have done a better job matching my blank to it. The rings are too thick for one. Blackwood, maple and padauk on a shortened aluminum Raw kit. This one was very tedious to get right, but I think it turned out nicely. Acrylic blank from Exotic Blanks (can't remember the name) on a Long Clicker. I don't usually turn acrylics, but had a gift card from the contest in February (thanks again to everyone), and liked this one. I need to find a better insert for it. Tamboti on a Dinero. This was sort of a trial pen. I like the wood, don't love the kit. I've got another of the kits that I'll likely try to make into a closed end pen to get rid of the ugly end caps. Otherwise it's a decent desk pen. 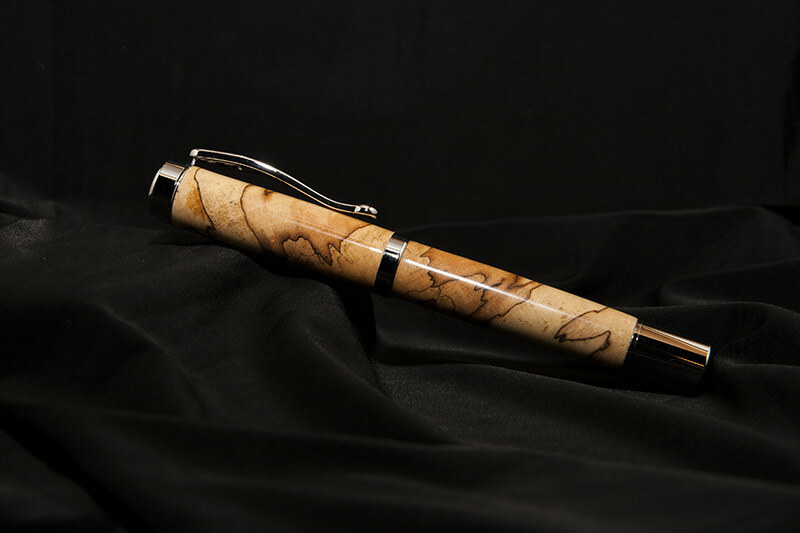 And this one was my entry for the "pretty wood" contest, spalted maple on a Continental. Nice group! Shape and finish look spot on. Its hard to pick a favorite. Those are well done! I'm partial to the segmentation, but all look excellent. The fingerprints were of no distraction. Nice work , I think you are your own worst critic, you see things most others won't. The first one reminds me of flying over the Grand Canyon. Beautiful! Roller Ball or Fountain? Beautiful group of pens. I really like the segmented one but the spalted maple on the bottom steals the show for me. I can see why you entered it in the PWP contest. Thanks for all the kind words! Vic, the Shakespeare is a RB. The only fountain pen I've ever turned is that Continental you see at the end, and I've never even filled that one. For my writing style, I don't think a fountain would ever work for me. Just to clarify things, you may not like the kit you're showing as much as you hoped you would, but it's not a Mistral. I would hope that you DO like the Mistral if you get to try one. Doh! Sorry Phil, it's a Mirage. Thanks for the correction!